John Hoppner RA (4 April 1758 – 23 January 1810) was an English portrait painter, much influenced by Reynolds, who achieved fame as a brilliant colourist. Hoppner was born in Whitechapel, London, the son of German parents – his mother was one of the German attendants at the royal palace. 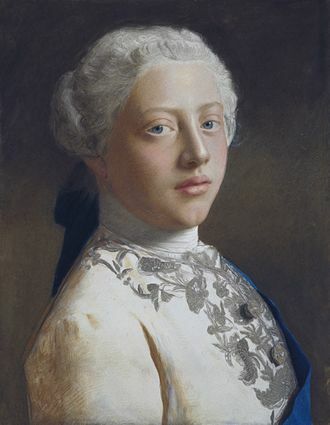 King George showed a fatherly interest and patronage of the young boy that gave rise to rumours, quite unfounded, that he may have been his illegitimate son. Hoppner became a chorister at the royal chapel, but, showing strong inclination for art, in 1775 he entered the Royal Academy. 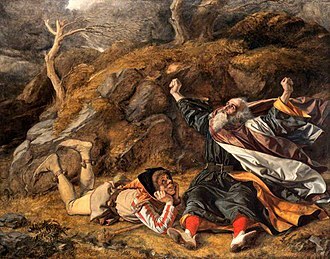 In 1778 he took a silver medal for drawing from life, and in 1782 the Academy's highest award, the gold medal for historical painting, his subject being King Lear. Hoppner first exhibited at the Royal Academy in 1780. His earliest love was for landscape, but necessity obliged him to turn to the more lucrative business of portrait painting. At once successful, he had throughout life the most fashionable and wealthy sitters, and was the greatest rival to the growing attraction of Thomas Lawrence. He rarely attempted ideal subjects, though a Sleeping Venus, Belisarius, Jupiter and Io, a Bacchante and Cupid and Psyche are recorded among his works. 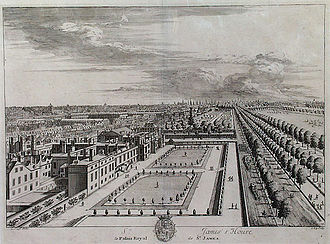 The Prince of Wales visited him especially often, and many of his finest portraits were hung in the state apartments at St James's Palace, notably those of the prince himself, the Duke and Duchess of York, Lord Rodney and Lord Nelson. 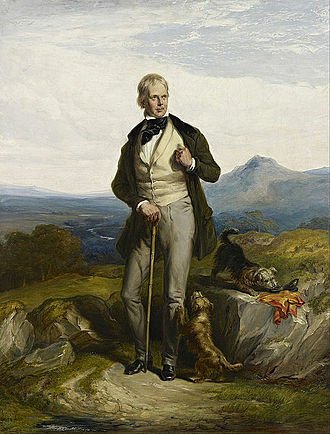 His other sitters included Sir Walter Scott, the Duke of Wellington, Henry Bartle Frere and Sir George Beaumont. Competent judges have deemed his most successful works to be his portraits of women and children... He was confessedly an imitator of Reynolds. When first painted, his works were much admired for the brilliancy and harmony of their colouring, but the injury due to destructive mediums and lapse of time which many of them suffered caused a great depreciation in his reputation. The appearance, however, of some of his pictures in good condition has shown that his fame as a brilliant colourist was well-founded. His drawing is faulty, but his touch has qualities of breadth and freedom that give to his paintings a faint reflection of the charm of Reynolds. In 1803 he published A Series of Portraits of Ladies, engraved after his paintings by Charles Wilkin, and in 1805 a volume of translations of Eastern tales into English verse. In his later years Hoppner suffered from a chronic disease of the liver. He died on 23 January 1810. ^ "Artist Info". nga.gov. Retrieved 2 June 2018. ^ First Proofs of the Universal Catalogue of Books on Art, Volume 1. London: Chapman and Hall. 1870. p. 868. ^ The Gentleman's Magazine. 1834. p. 445. Hoppner, John. Oriental Tales (London: J. Hatchard, 1805). Lee, Sidney, ed. (1891). "Hoppner, John" . Dictionary of National Biography. 27. London: Smith, Elder & Co. p. 342. Cole, Timothy. Old English Masters (New York : The Century Co., 1902) p. 91 ff. Wikimedia Commons has media related to John Hoppner. Princess Frederica Charlotte of Prussia was the only daughter of Frederick William II of Prussia and his first wife Elisabeth Christine of Brunswick-Lüneburg. She was Duchess of York and Albany following her marriage to Prince Frederick, Duke of York, Frederica Charlotte was born in Charlottenburg, on 7 May 1767. She was the child of her parents, whose union was extremely unhappy due to their mutual infidelities. After several affairs with musicians and officers, Fredericas mother, the Crown Princess, she planned to escape from Prussia with her lover, but she was betrayed and captured, causing a public scandal. After a divorce was granted, Elisabeth Christine was placed under house arrest in the castle of Stettin. On 29 September 1791 at Charlottenburg Palace, she married Prince Frederick, Duke of York and Albany, there was a second marriage ceremony at Buckingham House on 23 November. The new Duchess of York received a welcome in London. The marriage was, not a one, and by 1794, it had become apparent that the Duke. In 1790, she received a medal from the Society of Arts. Born in Birmingham in 1755, Mary Linwood moved to Leicester in 1764 with her family after her father and he died young and her mother opened a private boarding school for young ladies in Belgrave Gate. When her mother died Mary took over the school and continued it for 50 years, Mary made her first embroidered picture when she was thirteen years old, and by 1775 had established herself as a needlework artist. 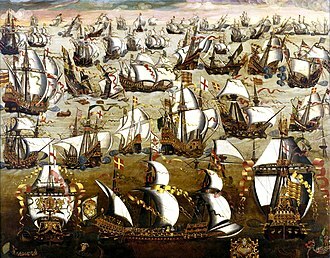 By the age of 31, Mary had attracted the attention of the royal family, for nearly seventy-five years Mary worked in worsted embroidery, producing a collection of over 100 pictures that specialised in full size copies of old masters. She opened an exhibition in the Hanover Square Rooms in 1798, Mary Linwoods copies of old master paintings in crewel wool, in which the irregular and sloping stitches resembled brushwork, achieved great fame from the time of her first London exhibition in 1787. She met most of the heads of Europe. 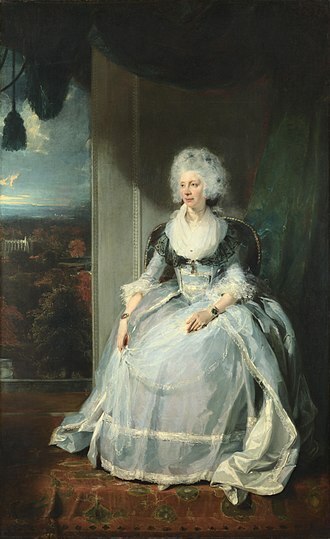 She exhibited in Russia and Catherine the Great offered £40,000 for the collection while the Tsar offered her £3,000 for one example. However, Mary refused as she wished her work to remain in England, on one occasion her copy of a painting by the Italian artist Salvator Rosa sold for more than the original. One of Marys own designs, the Judgement of Cain, took ten years to complete and her exhibition in Leicester Square, was the first art show to be illuminated by gaslight. The exhibition consisted of copies of paintings after such masters as Carlo Dolci, Ruisdael, Morland, Marys subjects included Lady Jane Grey and Napoleon, whose portrait was said to have been done from life. 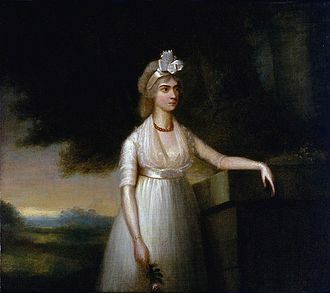 He conferred on Mary the Freedom of Paris in 1803, so successful was Mary Linwood that she was able to commission John Hoppner to paint the portrait on this page. By this time Hoppner was principal painter to the Prince of Wales, John Constables first commissioned work was to paint the background details in one of her works. Mary is said to have refused an offer of 3000 guineas for her version of Carlo Dolcis Salvator Mundi, the needle work pictures continued to be exhibited in Leicester square in London continuously for forty years. Patience Lovell Wright was the first recognized American-born sculptor. She chiefly created wax figures of people and she loved to write poetry and was a painter. Patience Lovell was born at Oyster Bay, New York, into a Quaker farm family with a vegetarian diet, the family moved to Bordentown, New Jersey when Patience was four years old. At age 16 she left the home and moved to Philadelphia, where in 1748 she married Joseph Wright. For years she had amused herself and her children by molding faces out of putty, bread dough and she had an energetic wildness when she worked for she loved the work she did. By 1770, Patience and Rachel had become successful enough to open a house in Philadelphia. The Manhattan outpost, on Queen Street, was the successful of the two, but when fire ravaged the block in June 1771, all of Wright’s work was destroyed. After the fire on Manhattan Outpost she decided to relocate to London to pursue her trade there and she had acquired the public support of Benjamin Franklin through her acquaintance with his sister, Jane Mecom. Armed with a letter of introduction from Franklin, she was accepted into London society, although her unorthodox comportment. She sculpted wax figures of both loyalist and patriots, according to some books, she became a spy for the cause, sending information overheard from her subjects on how the British were preparing for the war to America inside her wax figures. When Wright was constructing sculptures of Patriot sympathizers, she didnt want anyone who may inform the King to know, so if she had visitors while constructing an the sculptures she would hide the bust underneath her apron and try to distract her visitor by engaging in a conversation. Wrights sculpture of friend William Pitt still stands in Westminster Abbey Museum, other notable subjects she modeled included Lord Lyttelton, Thomas Penn, Admiral Richard Howe, and Charles James Fox. Some of Wrights supporters include Benjamin Franklin, Deborah Sampson, the King and Queen of England, after the War of Independence turned to open rebellion, Wrights trade decreased dramatically. 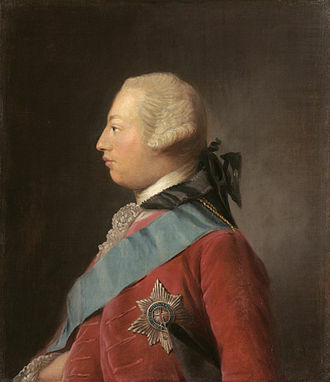 The Prince Frederick, Duke of York and Albany KG GMB GCH, a member of the House of Hanover, was the second son and child of King George III, King of Great Britain and Ireland and Elector of Hanover. However, he died before his brother, Prince Frederick Augustus, or the Duke of York as he became in life, belonged to the House of Hanover. 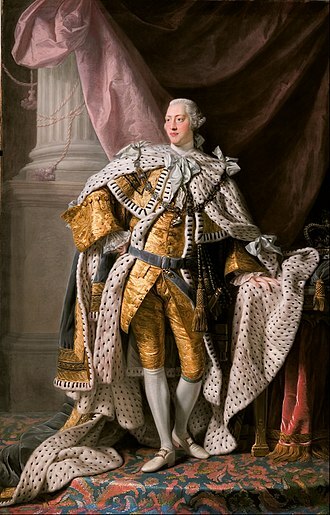 He was born on 16 August 1763, at St. Jamess Palace and his father was the reigning British monarch, King George III. On 27 February 1764, when Prince Frederick was six months old and he received this title because his father, as Elector of Hanover, was entitled to select every other holder of this. He was invested as Knight of the Most Honourable Order of the Bath on 30 December 1767, George III decided that his second son would pursue an army career and had him gazetted colonel on 4 November 1780. From 1781 to 1787, Prince Frederick lived in Hanover, where he studied at the University of Göttingen and he was appointed colonel of the 2nd Horse Grenadier Guards on 26 March 1782 before being promoted to major-general on 20 November 1782. Promoted to lieutenant general on 27 October 1784, he was appointed colonel of the Coldstream Guards on 28 October 1784 and he was created Duke of York and Albany and Earl of Ulster on 27 November 1784 and became a member of the Privy Council. He retained the bishopric of Osnabrück until 1803, when, in the course of the preceding the dissolution of the Holy Roman Empire. On 26 May 1789 he took part in a duel with Colonel Charles Lennox, who had insulted him, Lennox missed, on 12 April 1793 Frederick was promoted to full general. 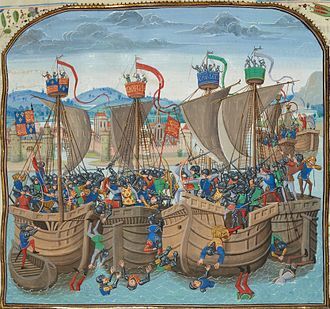 That year, he was sent to Flanders in command of the British contingent of Coburgs army destined for the invasion of France and his command fought in the Flanders Campaign under extremely trying conditions. He won several engagements, such as the Siege of Valenciennes in July 1793. 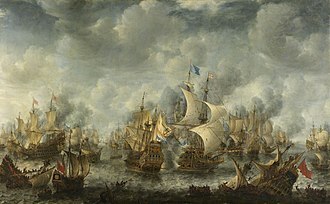 In the 1794 campaign he was successful at the Battle of Willems in May but was defeated at the Battle of Tourcoing that month, the British army was evacuated through Bremen in April 1795. Sir Thomas Lawrence PRA FRS was a leading English portrait painter and the fourth president of the Royal Academy. He was born in Bristol and began drawing in Devizes, where his father was an innkeeper, at the age of ten, having moved to Bath, he was supporting his family with his pastel portraits. 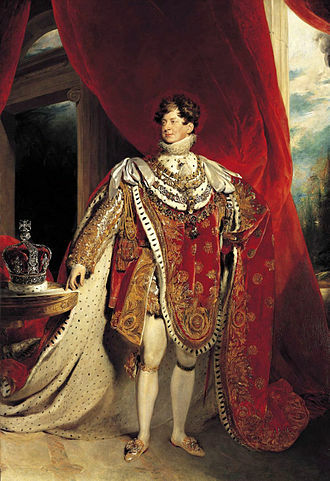 At eighteen he went to London and soon established his reputation as a painter in oils, receiving his first royal commission. He stayed at the top of his profession until his death, aged 60, self-taught, he was a brilliant draughtsman and known for his gift of capturing a likeness, as well as his virtuoso handling of paint. He became an associate of the Royal Academy in 1791, a member in 1794. Lawrences love affairs were not happy and, in spite of his success, at his death, Lawrence was the most fashionable portrait painter in Europe. His reputation waned during Victorian times, but has since been partially restored, Thomas Lawrence was born at 6 Redcross Street, the youngest surviving child of Thomas Lawrence, a supervisor of excise, and Lucy Read, the daughter of a clergyman. The couple had 16 children but only five survived infancy, Lawrences brother Andrew became a clergyman, William had a career in the army, sisters Lucy and Anne married a solicitor and a clergyman. Soon after Thomas was born his father decided to become an innkeeper and took over the White Lion Inn and next-door American Coffee House in Broad Street, Bristol. It was during the familys stay at the Black Bear Inn that Lawrence senior began to make use of his sons precocious talents for drawing and reciting poetry. 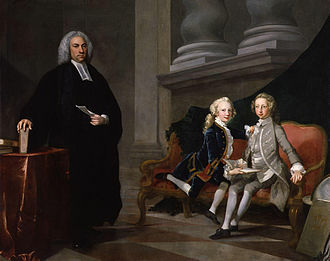 Visitors would be greeted with the words Gentlemen, heres my son – will you have him recite from the poets, among those who listened to a recitation from Tom, or Tommy as he was called, was the actor David Garrick. 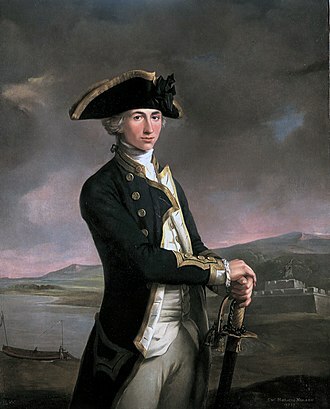 Lawrences formal schooling was limited to two years at The Fort, a school in Bristol, when he was aged six to eight, and he became accomplished in dancing, fencing and billiards. But once again Lawrence senior failed as a landlord and, in 1779, he was declared bankrupt, from now on, Lawrence was to support his parents with the money he earned from his portraits. Sir George Howland Beaumont, 7th Baronet was a British art patron and amateur painter. He played a part in the creation of Londons National Gallery by making the first bequest of paintings to that institution. Beaumont was educated at Eton College, where he was taught drawing by the landscape painter Alexander Cozens. The first paintings to enter Beaumonts collection were by artists he knew, on his return he began to assemble a collection of Old Master paintings despite his relatively modest means. 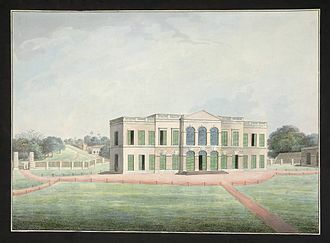 In 1785 Lady Beaumont inherited the lease of 34 Grosvenor Square and this circle expanded when Beaumont became Tory MP for Beer Alston in Devon from 1790 to 1796, but his enthusiasm for politics was short-lived and he soon returned to his artistic pursuits. A picture gallery was added to the house in 1792 to accommodate their growing art collection, the Beaumonts went on frequent sketching tours of the Lake District and of North Wales, necessitated by Sir Georges having caught a fever during his Grand Tour. 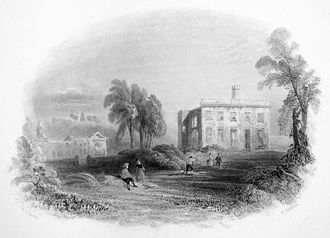 For their Welsh excursions they rented Benarth, a house near Conwy, Coleorton was to become Beaumonts main place of residence, and was rebuilt to a design by George Dance the Younger from 1804 to 1808. A friend of the Lake Poets, with whom he considered himself a kindred spirit, Beaumont lent out the farm of the estate to William Wordsworth and his family in the winter of 1806. They were briefly joined there by Samuel Taylor Coleridge, but Beaumont was unable to establish the same rapport with this poet as with Wordsworth, despite his openness for romantic poetry, Beaumont was less receptive of new developments in painting. 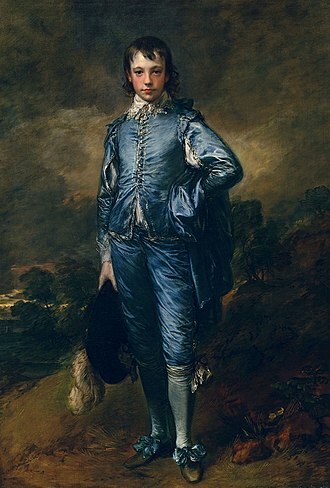 A staunch defender of the ethos of Sir Joshua Reynolds, he was one of J. M. W. Turners most vehement critics. This oppressive stance on matters of taste was to him the epithet of supreme Dictator on Works of Art from his old friend Thomas Hearne. Nonetheless, Beaumont did welcome some sympathetic artists, including the young John Constable, the most famous fruit of Beaumonts patronage is the Constables painting of the cenotaph erected to Reynolds in the grounds at Coleorton. 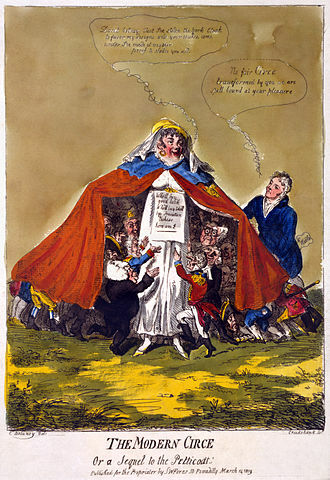 The publication in 1815–16 of a series of satirical Catalogues Raisonnés, probably by Robert Smirke, ridiculed Beaumont for his conservatism, after which he retired from public life to Coleorton. 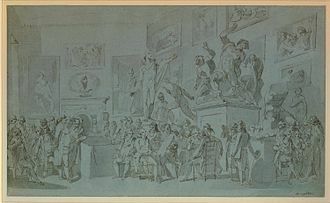 A visit to Italy in 1821 in which he met Antonio Canova restored his morale, and while there he bought the Taddei Tondo by Michelangelo and this last stay in Italy convinced him of the need to educate British taste by establishing a public gallery of Old Masters. Angersteins collection came up for sale in 1824 and Parliament, spurred on by Beaumonts offer, the National Gallery opened to the public in May 1824 in Angersteins former house on Pall Mall, and Beaumonts paintings entered its collection the following year. After suffering an illness, Sir George Beaumont died in Coleorton Hall on 7 February 1827. He was buried in Coleorton church, some paintings by his own hand have entered the New Walk Museum and Art Gallery in Leicester, while the rest remain in the Beaumont family collection. His title was inherited by his cousin George Howland Willoughby Beaumont, D.
A figure drawing is a drawing of the human form in any of its various shapes and postures using any of the drawing media. The term can refer to the act of producing such a drawing. The degree of representation may range from detailed, anatomically correct renderings to loose. A life drawing is a drawing of the figure from observation of a live model. A figure drawing may be a work of art or a figure study done in preparation for a more finished work such as a painting. Figure drawing is arguably the most difficult subject an artist commonly encounters, the human figure is one of the most enduring themes in the visual arts, and the human figure can be the basis of portraiture, sculpture, medical illustration, and other fields. Artists take a variety of approaches to drawing the human figure and they may draw from live models or from photographs, from skeletal models, or from memory and imagination. Most instruction focuses on the use of models in life drawing courses, in developing the image, some artists focus on the shapes created by the interplay of light and dark values on the surfaces of the body. For those working without visual reference, proportions commonly recommended in figure drawing are and this can be illustrated to students in the classroom using paper plates to visually demonstrate the length of their bodies. An ideal figure, used for an impression of nobility or grace, is drawn at 8 heads tall, a heroic figure used in the depiction of gods and superheroes is eight-and-a-half heads tall. Most of the length comes from a bigger chest and longer legs. Note that these proportions are most useful for a standing model, poses which introduce foreshortening of various body parts will cause them to differ. The French Salon in the 19th century recommended the use of Conté crayons, erasure was not permitted, the artist was expected to describe the figure in light strokes before making darker, more visible marks. A popular modern technique is the use of a stick, prepared from special vines. The charcoal adheres loosely to the paper, allowing very easy erasure, harder compressed charcoal can produce a more deliberate and precise effect, and graduated tones can be produced by smudging with the fingers or with a cylindrical paper tool called a stump. Southern Africa in 1878, on the eve of the confederation wars, with the Cape Colony in dark pink. 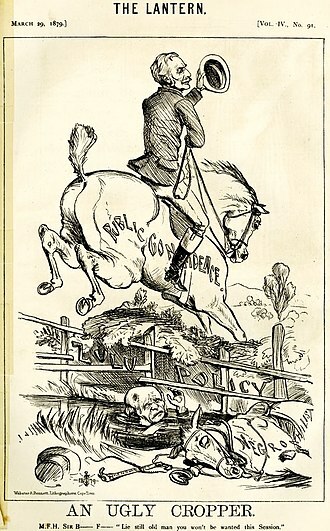 Pro-imperialist cartoon showing Sir Bartle Frere vanquishing the "negrophilist" liberals of the Cape government, represented by MP Saul Solomon. Sir Henry Bartle Frere in the 1880s. Portrait of Georgiana St Leger and her son Pascoe St Leger Grenfell.